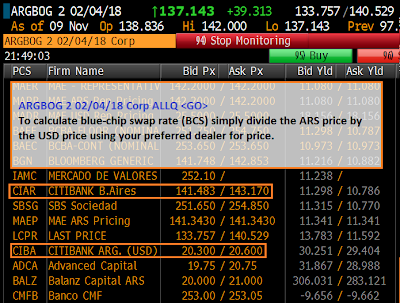 Quick post since I've been approached multiple times in the last few weeks about the calculation of the Blue Chip Swap Rate (BCS), a popular unofficial measure of the market-driven price of ARSUSD (NDFs settle against the official ARSUSD cross, which is tightly controlled by the central bank). As you can see, the current BCS for USDARS is ~6.86 vs the official rate at 4.77, representing a large premium on USDs by the Argentine population. With inflation persisting and Banco Central de la Republica Argentina (BCRA) keeping peso depreciation under the rate of actual inflation (and equal to the official inflation measure) the Argentine peso becomes more overvalued every day that passes, making exports increasingly uncompetitive in the global markets (reducing supply of USDs by reducing the current account balance), depressing the local economy and exacerbating capital flight despite a plethora of capital controls introduced over the last 14 months. The most likely ending for this situation is a sudden and violent devaluation similar to the Mexican devaluation of December 1994 once BCRA loses its grip on the exchange rate. Last night, I finally came up with a concise way of expressing my Fed policy view: "Marginal purchases will continue until real term structure steepens." Real term structure flattening means that "too much money, not enough paper" is still valid, and marginal Fed LSAPs are reducing the supply of available financial assets enough to lower rates by increasing supply of reserves and reducing supply of risk-free assets. Bear steepening of the real term structure would mean that either marginal asset-buyers have decided other assets offer better prospective returns (flight-to-safety has ended), private credit is growing at a faster pace than the Fed is reducing supply of assets (deleveraging has ended) or, more likely, a combination of both. A side effect of rising and steepening real rates would be that the discount rate (ex-effect from break-evens) used to discount future private cash-flows would rise and therefore, all else equal, that would mean lower asset prices across the board for cash-flow generating assets. I use the real term-structure for this mental exercise because expected returns of non-risk free assets are affected by inflation expectations both in variable-rate instruments (loans, FRNs, some ABS, equities) through rate expectations and fixed-rate instruments as well through expected default rates and recovery expectations. Not to worry, though, falling asset prices due to higher real rates are an eventual inevitability of the Fed's exceptionally accommodating monetary policy and must be accepted as such. All it will mean is buying the same assets at higher expected returns, and should be welcome news for anyone with more financial assets than liabilities. If you follow me on twitter, you are by now very well acquainted with the title of this post. What it refers to is the fact that the Fed's LSAPs are creating a surplus of liquidity and scarcity of product in capital markets, which has driven prices up in any financial asset that generates yield (and many that don't). During this yield chase--or, as I like to call it, The Great Incredible Paper Chase--debt issuers have done what any rational party would have done when there is more demand than supply of a good they can produce, they've stepped up production. As long as the Fed is expanding their balance sheet, the market will have the capacity to absorb new issuance, but it is important to remember that the Fed's balance sheet expansion will not continue forever and that, at some point, they will halt expansion and/or mop-up reserves. At that point, if the issuance of new paper and the capacity of the market to absorb it are in equilibrium, the equilibrium will be upset and, like anyone who has taken an economics 101 course can tell you, prices will reflect it. So, before getting into a fist-fight over the last tootsie roll left in the mud after the yield piñata, remember that the eventual draining of reserves by the Fed will have full-size snickers raining from the skies and no amount of tootsie rolls will be a fair trade for even a bite-sized milky way. Y u hate capital so much?! Given that we are starting with a capital-constrained banking system (even before write-downs or 2013 EBA recommendations), we know this, holding capital levels stable, any government deficit must be matched by foreign capital or by reduced lending to the private sector to maintain leverage ratios stable--of course, due to 0%-RW on SPGBs, the EUR amt need not match centavo for centavo. Now, retained earnings (new capital) are not zero, so banks can either maintain their balance sheet size and increase their capital ratio (delever), or increase balance sheet size (fund the deficit) and maintain their capital ratio, or--most likely--something in between, where purchases of new sovereign bonds against increases in capital and levered via LTRO produce large amounts of carry. This gives us the illusion that banks may very well be able to earn their way out of this mess (see also: LTRO), however, this all changes if we change the risk weight on SPGBs to something other than its current level of zero. Which is were we ask ourselves: In a country where almost 3/4 of private household wealth (ex expected benefits from government pensions, etc) is held as housing equity which has been borrowed against, what happens to the sovereign if that # is cut in half? After all, the sovereign's creditworthiness is just the aggregate of the households. Its credit backed by its ability to tax and/or confiscate private wealth to pay back creditors. If the households are, collectively, broke, then what is left for the government to take? Which is where I--finally--get to my point. If the government represents the collective households and the collective households are overburdened, then how will they be able to back their sovereign's increasing promises as the banks decimate the private sector through loan attrition? Or, in simpler terms, Is there any difference between extending-and-pretending with the households' mortgages and extending-and-pretending with the sovereign's obligations? As we continue on our march to binary outcomes, I believe it becomes important to ask ourselves, why do we hate capital so much? What is so wrong about recapitalizing the banks and arresting this self-feedback loop? Is it about crystallizing losses by raising equity at prices below book? If so, why the big deal? If equity were really so under-priced, current shareholders would surely rush to a private offering before letting outsiders dilute them, no? As a final comment, I think there is a 4th possible solution: Capital injections from the core banks and sovereigns. Maybe this should actually be 3c, but given that we know there is no way except for "more capital" to resolve this and whether it be through debt-to-equity swaps or lower than normal real rates, Core private savings will ultimately pay for this. It might be nice to skip the whole near-financial-meltdown part that ends in core households recapitalizing their own banks after the D2E swaps and just get it over with so 25% of the worlds 12th largest economy could, you know, get back to work. On the heels of the Fed announcing it's latest round of LSAPs, we are suddenly seeing a flurry of media attention around the fact that, despite rocketing MBS prices, mortgage rates are simply not budging. Of course, regular readers are not surprised, as on September 9th I highlighted this very likely possibility in, The twist (redux), A point that David Schawel originally brought up on August 6th (and whose post title I shamelessly stole). ...there is evidence to doubt whether lower MBS spreads will be passed on to customers or whether the banks will keep the windfall. Despite current coupons trading at record tight spreads, the "primary-secondary" spread remains, not only stubbornly high, but near all-time record highs! Proponents of the MBS Twist insist that the Fed can put pressure on the "primary-secondary" spread and push savings to borrowers by increasing (more in a second) their purchases of current coupons, but to me it is clear that the problem lies in the demand, not supply, side of loans. This is why, unless we see further expansion of H.A.R.P. (Home Affordable Refinance Program) which increases the pool of homeowners eligible for refinance, I think the ultimate effect of an "MBS Twist" on aggregate demand will be limited and the ultimate economic beneficiaries will be banks and security holders who see their securities increase in price. Since Chairman Bernanke announced the latest round of open-ended LSAPs, current-coupon MBS has tightened 56bp to Treasuries while the primary-secondary spread widened 31bp to all-time record highs despite 7y Treasury notes trading 10bp wider than pre-FOMC. Meanwhile, earlier today, MBS traded flat to 10y swaps. It is clear who's keeping the windfall for now. Some market participants have described the mechanism through which quantitative monetary policy (read: LSAPs) works or is intended to work to be centered around inflation expectations. The line of thinking is that the Fed is trying to stoke inflation expectations to incentivise purchase of goods today by increasing the rate at which people expect the price level to increase while holding down rates, increasing the gap between yields and expectations of inflation, commonly referred to as the "real rate" and observed in the market for Treasury Inflation Protected Securities (TIPS). From the TIPS and US Treasury Notes and Bonds curves we can derive what we call "break-evens," or the level of future inflation at which payoffs of both TIPS and regular Treasuries are the same. There's some idiosyncrasies here because there is optionality in TIPS as and a right skew to inflation, and so it is possible (and in my opinion true) that this option is reflected in yields and TIPS holders are willing to pay an additional premium (which is constantly changing) for the embedded option which is ultimately reflected in break-evens, which are often interpreted as "inflation expectations." It is hard to ignore the sudden rise in break-evens coinciding with anticipation for Fed LSAPs (QE), and I am choosing to interpret this reaction as representative of market participant "animal spirits." The sudden rise in break-evens (71bp for 5y!!) means that a level of inflation above the Fed's symmetrical target is now "priced-in" for US Treasuries. Which leaves us with the question, "Will incremental asset purchases by the Fed increase the compounded annual rate of inflation by 0.70% over the next five years?" My opinion is that they will not and break-evens are showing us that there is either panic over what additional LSAPs mean for near-term inflation or there the option embedded in TIPS is being aggressively bought and the rise in break-evens reflects the rising premium of this hypothetical call option. While borrowers continue to deleverage, any impact from lower rates will be limited and as mortgage debt outstanding continues to fall, the marginal stimulative power of monetary policy, unfortunately, diminishes. Additionally,there is evidence to doubt whether lower MBS spreads will be passed on to customers or whether the banks will keep the windfall. Despite current coupons trading at record tight spreads, the "primary-secondary" spread remains, not only stubbornly high, but near all-time record highs! (see lower left). ... This is why, unless we see further expansion of H.A.R.P. (Home Affordable Refinance Program) which increases the pool of homeowners eligible for refinance, I think the ultimate effect of an "MBS Twist" on aggregate demand will be limited and the ultimate economic beneficiaries will be banks and security holders who see their securities increase in price. That is why, unless the Fed's continuing LSAPs are paired with fiscal stimulus (hopefully in the form of an extension of the HARP program) I have a hard time believing current break-evens will be achieved. Additionally, I have chosen to interpret the Fed FOMC's decision to embark in another round of LSAPs as confirmation the economy remains fragile and the growth outlook has not improved and, with gasoline prices flirting with $5/gal, and real wages still falling, it is hard to see how marginal purchases of mortgage securities (that have marginally diminishing impact) will manage to stoke aggregate demand to a level that drives meaningful inflation in the short term. Keeping mortgage rates low provides an increase in discretionary income for homeowners able to refinance at a lower rate but, if real wages don't grow and gasoline price increases are taking a significant portion of those savings, the beneficiaries are basically just treading water. And, if I had to guess, I would guess that a non-trivial portion of savings from any mortgage refinancing will go towards paying down revolving credit. That's why, against every piece of folksy advice* I've gotten from veteran traders, I am very much bullish on the 10-year Treasury Note. I bought exposure to this tenor because I think, in no uncertain terms, that inflation expectations have a harsh reality check coming, the embedded call in TIPS is grossly overpriced and--due to their healthy roll, favorable 2s10s steepness and high exposure to inflation expectations--the ten year note is the ideal way to play this thesis. As such, I will continue to buy weakness in the note and concentrate my duration exposure around this particular tenor. 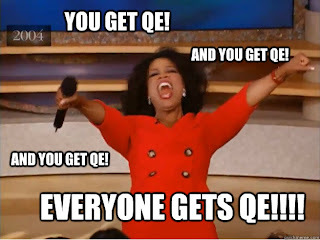 The market has become entirely too intoxicated with the promises of QE and has forgotten that monetary base expansion is not inflationary without both credit and wage growth. The you go, that is my thesis for buying dimes. In the words of my friend Kevin Ferry, "book it, time-stamp it, laminate it, decoupage it, roll it up and smoke it!" * "Don't fight the Fed," "Don't fight the tape," "Don't get married to a position," "There's old traders and bold trades but no old bold traders"
Labels: monetary policy, WHATEVER, Y SO SRS? With mortgage rates near record lows, due both to low inflation and negative real rates, the leveraged purchasing power of real wages is near historic maximums. Additionally, for the most part, it looks like the bottom is in for housing price declines. Does this make it a good time to buy leveraged real-estate to capture future price appreciation while financing it at low rates? I do not think it's as clear as many people think it is. Below we'll explore why. 30-year fixed-rate mortgage assuming 15% down-payment. The purchasing power of a fixed monthly payment is dependent on two things, the number of periods, and the interest rate. If we maintain the the number of payments constant and put interest rates on the x axis and purchasing power on the y axis, you can see how purchasing power declines at a declining rate as rates increasing. In other words, it is an inverse exponential function, the first derivative of purchasing power with respect to rates is negative while the second derivative is positive. To keep this exercise simple, we will consider the interest rate on a mortgage to be a function of a risk-free rate and a spread. For the sake of simplicity we will consider this spread as compensation the lender receives for taking-on various risks and duties (credit and prepayment risks as well as compensate the the servicer of the loan). The two accompanying screenshots illustrate the "primary-secondary" spread, or the spread between mortgage rates and the yield on mortgage-backed securities, and the spread between the yield of a 30-year current coupon MBS and the 10-year US Treasury Note. The sum of these two spreads roughly represents the aggregate spread between risk-free rates and the national average average mortgage rate. 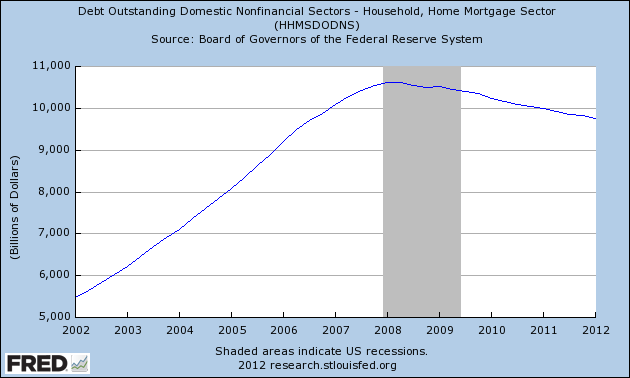 As previously discussed, this is one of the main channels in which the Fed has been supporting the property market. By lowering the Fed funds target and through LSAPs (Large Scale Asset Purchases, colloquially known as QE or Quantitative Easing) they increased the purchasing power of payments by lowering the spread of MBS trade at to treasuries and lowered interest rates. Later on, by buying US Treasury notes and bonds, in what is sometimes called QE2, they lowered interest rates. And, finally, with 2011s "Operation Twist," they helped flatten the yield curve and bring down longer-term interest rates. By buying Treasuries and Agency MBS, the Fed pushed underlying risk-free rates down and and helped put downward pressure on the spread by pushing down the value of the embedded option in the securities (lowering implied volatility of the embedded option). Finally, we need to recognize that the risk-free rate is also a function of two factors, the real rate of interest and future inflation expectations. The real rate of interest + inflation expectations equal the nominal rate of interest. We can observe the real rate of interest through Treasury Inflation Protected Securities (TIPS) and can compute inflation expectations by comparing that to the yield on regular treasuries, this is called the break-even rate. Therefore we now see that the purchasing power of a monthly payment is dependent on the mortgage spread, the level of real rates, and the market's expectation of future inflation. You're probably thinking, "gee, thanks for the lesson, but what does this have to do with home prices?" Well, everything. As you can see from the charts above, both the spread on MBS and the level of real rates (how much return lenders expect to earn after inflation) are both at historical lows and the primary-secondary spread is refusing to fall despite record-tight spreads to treasuries. Increases in either real rates or MBS spreads would, unless accompanied by falling inflation expectations or lower primary-secondary spread, cause a fall in purchasing power. In fact, an increase from present mortgage rates of just 0.50% would lower the purchasing power of a payment by almost 6%! Until now we have worked through this exercise assuming the payment is fixed but, historically, we find that home prices tend to roughly follow wages. As you can see from the chart to the right, the payment required to buy a median price existing-home using the national average of mortgage rates mostly oscillates between 25% and 35% of median household income (mean is 30%). In other words, housing prices are constrained by purchasing, which is a function of wages and and interest rates. Which, finally, leads me to the reason I do not believe increases in home prices are as sure a bet as many think. For home prices to sustainably exceed inflation, wage gains have to outpace inflation by more than the increase in rates over that same time period. We saw in the first chart that purchasing power increases at an increasing rate as rates decline. Here, we can see that see that, at a fixed interest rate, purchasing power increases at a stable rate with payment. This means that for home prices to sustainably increase, growth in wages not only has to outpace inflation, but it has to outpace it by a margin wide enough to compensate for losses in purchasing power from any changes in the mortgage rate during that same period. The Federal reserve is taking extraordinary actions to keep interest rates, risk-spreads and implied volatility low in order to stimulate the economy and achieve their 2% inflation-rate target. 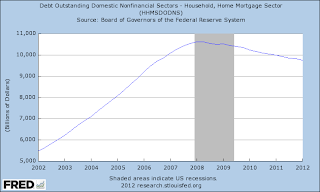 Remember Chairman Bernanke publicly stated, "[the 2 percent target is] not a ceiling, it’s a symmetric objective." While this leaves the door open for future easing in the near-term, we need to remember that, at some point, the easing cycle will stop and drop in real rates will stop, even if it seems unthinkable now. My good friend David Schawel and I like to joke around that the Fed was nice enough to allow us to recognize all the future income of our bonds early. And, in a way, this is exactly what the Fed is trying to achieve with housing. By inflating purchasing power through lower real rates and compressed spreads, the Fed has allowed home-owners to recognize the future appreciation of their property at an accelerated pace. In the future, as real growth returns and, with it, real rates rise, the purchasing power of a payment will drop and rising home prices will require either households to devote a larger % of household income to housing and/or wages to increase at a rate faster than inflation. Remember, a 0.5% increase in mortgage rates from current levels would reduce purchasing power by about 5.94% if we maintained payment unchanged. At the same time, the increase in payment for a stable loan price if rates rose 0.50% would be 6.32%. In other words, to maintain prices stable, monthly outlays need to increase at a faster rate than pricing power decreases due to any change in rate moves. Depressed real estate prices and low financing rates are leading many to see the current climate as a golden opportunity to buy leveraged real-estate, but price increases are not guaranteed, and the pay-out on a leveraged bet on housing is dependent many different factors. While affordability remains high and payments as % of income are near historic lows due to the Fed's extremely accommodating policy, an economic recovery can put an end to Fed accommodation and suspension of the Fed's MBS reinvestment program would be reflected on both, the risk-free interest rate and the spread at which MBS trade, turning a tailwind into a headwind for price appreciation. Leveraged buyers also run the risk of near-term price declines or inflation rates below the rate priced in by nominal rates. Leveraged real estate requires price appreciation and/or profits from rents to outpace the rate of inflation built-in to interest rates, which as we already saw, is not near lows. I don't have an opinion on whether residential real-estate is a good or bad investment, it's not my line of work, but I think many investors are failing to see that a leveraged bet on real-estate price appreciation is, indirectly, a bet on inflation exceeding current inflation expectations and future wages increasing at a rate faster than inflation. Under an inflationary environment, increases in the real price level of real estate would require a mix of an increase in the % of income spent on housing and real wages in order to allow growth in outlays to outpace the loss in purchasing power created by any increase in real-rates, inflation expectations, or mortgage spreads. 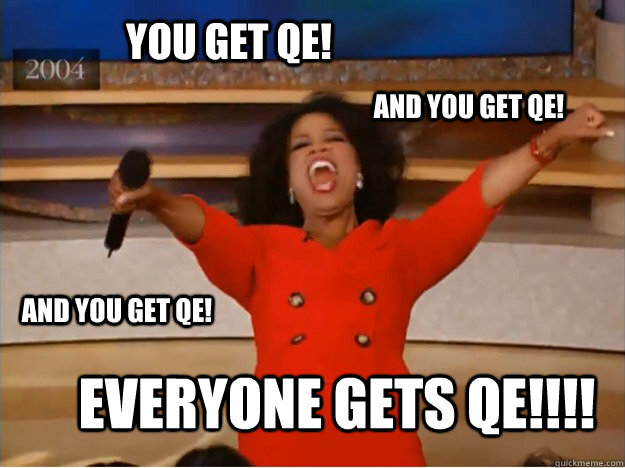 Much has been written about the possibility of further Large Scale Asset Purchases (LSAPs, or QE) by the Fed. One of the main points of focus has been speculation about where those, if any, additional purchases will take place. One of the more probable, in my opinion, options is what has been called the "MBS Twist" by various analysts and strategists, including Harley Bassman of Credit Suisse. The "MBS Twist,"--a reference to the decision by the Fed to transact monetary policy by changing the maturity structure of its holdings, originally in 1961, and most recently in August 2011--would be a balance-sheet neutral operation in which the Fed sells MBS holdings with higher coupons to buy so-called "current coupon" (trading closest to, but not exceeding par) MBS. This would mean selling bonds in which the embedded short call-option is in-the-money to buy bonds where the embedded option is at-the-money and longer-dated. This should, in theory, reduce the market clearing price of the embedded option which would be seen as a compression of implied volatility in the market. The idea behind this action is to compress the spread of current-coupon Agency MBS over treasuries (pictured right) and hope the compression in spread is eventually passed on to borrowers in the form of lower yields to incentivize home purchases or loan refinancing. In theory, this is a pretty clever plan. Lower rates increase the purchasing power of a monthly payment exponentially (illustrated left). This helps support housing prices and increase the purchasing power of buyers. It also allows means people with existing loans can refinance, save money and hopefully spend that money on goods and services and drive the recovery in aggregate demand. Unfortunately, although I think the "MBS Twist" is highly probable, I have very little faith in its power to stimulate the economy. As it has been tirelessly repeated through the economic blogosphere, we are stuck in a balance-sheet recession, and people are continuing to deleverage (see center left) even when, as my friend David Schawel has pointed out, it might not be in their best interest. yield borrowers pay, and what MBS yield. Additionally,there is evidence to doubt whether lower MBS spreads will be passed on to customers or whether the banks will keep the windfall. Despite current coupons trading at record tight spreads, the "primary-secondary" spread remains, not only stubbornly high, but near all-time record highs! (see lower left). Proponents of the MBS Twist insist that the Fed can put pressure on the "primary-secondary" spread and push savings to borrowers by increasing (more in a second) their purchases of current coupons, but to me it is clear that the problem lies in the demand, not supply, side of loans. This is why, unless we see further expansion of H.A.R.P. (Home Affordable Refinance Program) which increases the pool of homeowners eligible for refinance, I think the ultimate effect of an "MBS Twist" on aggregate demand will be limited and the ultimate economic beneficiaries will be banks and security holders who see their securities increase in price. That being said, I want to make it clear that I believe there is a very high probability of an "MBS Twist." I believe that with inflation declining, unemployment stubbornly high and total gridlock by the pathetic cowards and liars that make-up the legislative branch, Chairman Bernanke will continue to lead the effort to maintain the recovery on-track with the tools available to the Federal Reserve, limited as they may be. And judging by the first chart in this post, I am not the only one to think so. One of the reasons that I find the "MBS Twist" or a new round of MBS LSAPs as the most probable form of additional easing is that the Fed is already doing the MBS twist. Every month the Fed receives cash-flow representing interest and principal on their approx $530 billion in Fannie Mae 4.5-5.5% pools from the first round of LSAPs. The portion of that cash-flow representing principal repayments is reinvested into current coupon MBS in order to maintain the size of the Fed's balance sheet. In other words, every month, the portion of the Fed's MBS portfolio held in the new Fannie Mae 3s increases. The fact that this is something that is already happening makes me think that simply speeding up this process would be a natural extension of present policy. One of the arguments against equities that has been tirelessly repeated by managers like Hussman and Grantham has been that profit margins were too high and were due for mean reversion. Profit margins are indeed high, at approximately +2.8 standard deviations, or 10.6%, as a result of low interest rates (low cost of capital), depressed labor costs stemming from high unemployment and a near record low effective corporate tax rate (~18.6%). The main argument for profit margin mean-reversion is that high margins invite new competition while low margins discourage new entrants. Profit margins are also important to investors because steep reductions in profit margins tend to be coincident with steep drops in corporate profits. While the prior charts may be alarming to equity investors seeing record-high (+2.8 stdev on latest quarter, or approx 10.6%) profit margins, we should ask ourselves, what will cause this mean reversion? The economy seems to be creating about 2 million jobs a year right now, not exactly enough to put heavy pressure on labor markets. Fixed Investment continues to be pathetic (more here). The 10y yield has dropped 50 basis points since the beginning of the year and 1.5% from last year's median. What is left? Are underlying gross margins really that high? If so, why aren't new entrants taking advantage of cheap labor, low rates, and plentiful capital to undercut the competition and get a piece of those juicy, juicy margins? 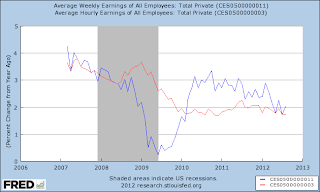 Could it actually be the that maybe underlying margins on goods and services are not THAT high? 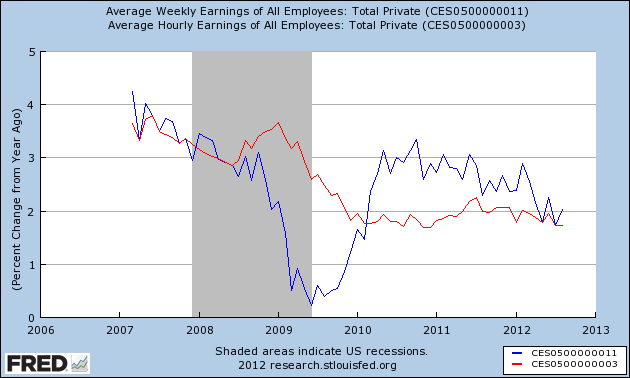 Below you'll see a now similar chart which includes pre-tax corporate profits. As you can see, while pre-tax margins are elevated, they are much less alarming at +1.33 standard deviations and the rest is the effect of a near record low tax rate of 18.6%. In conclusion, it appears that the only danger to corporate profits in the short term is a large, sudden increase in the effective tax rate or a sudden drop in final demand leading to a drop in sales and profits. With interest rates still falling and a multi-year liability repricing cycle, there is little immediate danger from a bottom in rates. Additionally, a fixed investment and/or employment boom which drove the cost of labor upwards would mean increases in final demand and GDP, leading to shrinking margins coupled with growing top-lines, not exactly a disaster. Unless you see a recession in our very near future, it seems there's simply nothing to see here. Premiums across the board increased. Covered calls remain the least ugly duckling, Bond funds getting kraykray. CEF investors holding funds trading at a premium to NAV would probably be well served by considering switching to ETFs or open-ended MFs. Came back from two weeks away to find The Great Incredible Paper Chase as alive as ever, with HY premiums 1.18 stdevs above mean and weighted-average premiums at 17% for the sector. National, CA and NY muni funds all back near 1stdev richness and senior loans flirting with 9m highs as the premium range compresses to the upside. The loan stand-out are covered call funds, which are .83 stdevs cheap to mean with the bulk of the funds (> 50%) trading with discounts higher than 10% and over 60% of fund discounts 0.5 stdevs higher (cheaper) than their historical mean. There appears to be relative value in this sector for the total-return focused investor that doesn't mind missing out on some upside if a long, rapid and sustained rally in equity occurs. The Great Incredible Paper Chase is not dead yet. Fixed cash flows are still commanding higher premiums (or lower discounts). The disparity between senior loans and high yield will not last long, though. If risk asset volatility settles down, expect senior loan funds to significantly outperform HY as the sector and the underlying asset-class offer better value. Despite a notable uptick to equity implied volatility which should lead to higher option premiums, covered call funds remain the least-loved funds. Muni funds remain well bid even as the underlying assets have failed to keep up with treasuries (ratios expanding). Notable exceptions are Build America Bond funds which carry significantly lower premiums (higher discounts) than their taxable cousins despite higher distributions. In August 1998, the Chinese government issued bonds to recapitliase the big four banks. explicitly burdened future taxpayers to fund a capital injection. Two drunks holding each other up, anyone? Walter, Carl E.; Fraser J. T. Howie (2011-01-19). Red Capitalism: The Fragile Financial Foundation of China's Extraordinary Rise (Kindle Location 1069). John Wiley and Sons. Kindle Edition. I recently ran across a few headlines and news stories which claimed Romney had promised to stop borrowing from China. I had to read them a few times and then a few times again because, as I remembered, Romney claimed to know a little bit about economics and this was an egregiously incorrect statement, showing either a complete ignorance about the most basic aspects of the global economy, or a wish to exploit the fears of the Republican masses. Since I'd like to think he's not a total scum-bag, I'm going to assume it's the first. ...foreigners do not fund fiscal deficits. They fund current account deficits, and as an accounting requirement the size of the current account deficit is exactly equal to the net foreign funding. Capital account inflows must exactly match current account outflows. The direction of causality can go either way. If investment in the US is so high, for example, that it is impossible for US savings to supply the full demand (as occurred during much of the 19th Century), then the US must import foreign capital to make up the shortfall. Suppose foreign central banks have decided for domestic reasons (for example in order to generate domestic employment) to accumulate hoards of US government obligations and so run a trade surplus. This will cause a surge of net capital inflow into the US. In that case the US must run a current account deficit equal to the net inflow. As is obvious to anyone following the developments of the global economy over the last 10 years, the obvious scenario is the latter. The US Treasury doesn't need China's money, China needs US Treasuries as a way to warehouse its FX reserves in order to maintain its current account surplus. In fact, China reducing its holdings of US Treasuries would be net stimulative to the American economy as the US trade deficit with China means that, along with knicknacks and iPods, the US is also importing Chinese unemployment. Unless the US Treasury starts emitting dim sums (borrowing in CNY or CNH), the US is not borrowing from China. This is not subject to discussion.